EIM Timers – Welcome to the EMIT Technical Forum! The EIM is capable of running eight (8) general purpose timers and three (3) EMD compliance timers simultaneously. Timers can be viewed, updated, or created from the Timer Management screen (Pg. 20) of the EIM. The screen can be accessed by selecting the “Timers” button in the footer of the display. A security level of Setup or Engineering is required to update or create timers. To create a timer, select the any of the available “Add” buttons on the right side of the Timer Management screen (Pg. 20) while in Setup or Engineering security mode. The button will navigate to the Timer Add/Edit screen (Pg. 21). “Timer” Button – Defines the name of the timer. “Count Time” Button – Defines the length of the timer in weeks, days, or hours. Count times are always converted to hours after entry. Description “Edit” Button – Add or edits a description of the timer. “Real Time” counts down the timer regardless of the engine running status. “Engine Runtime” only counts down the timer when the engine is running. “Annual” Buttons – Enable an “or annual” condition to the timer so that it will also expire after one year, regardless of the timer count remaining. After choosing the desired options, select the “Submit” button to confirm and start the timer. “Timer” – Name of the timer. “Remaining” – Time remaining in hours and minutes. “Status” – Displays the current status of the timer. “Running” – The timer is currently counting down. 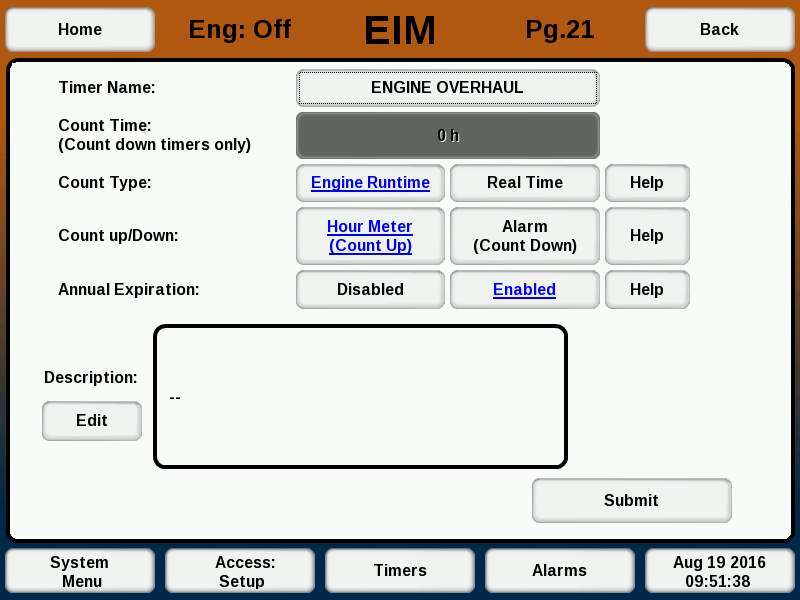 “Engine Off” – The count type of the timer is “Run Hours”, the engine is off, and the timer is not counting down. “Past Due” – The timer has expired and is no longer operational. “Annual” – Displays date and time of the annual expiration of the timer. If no annual option was enabled, “(Not Used)” will be displayed. Select the “View” button to view additional details or edit the timer. 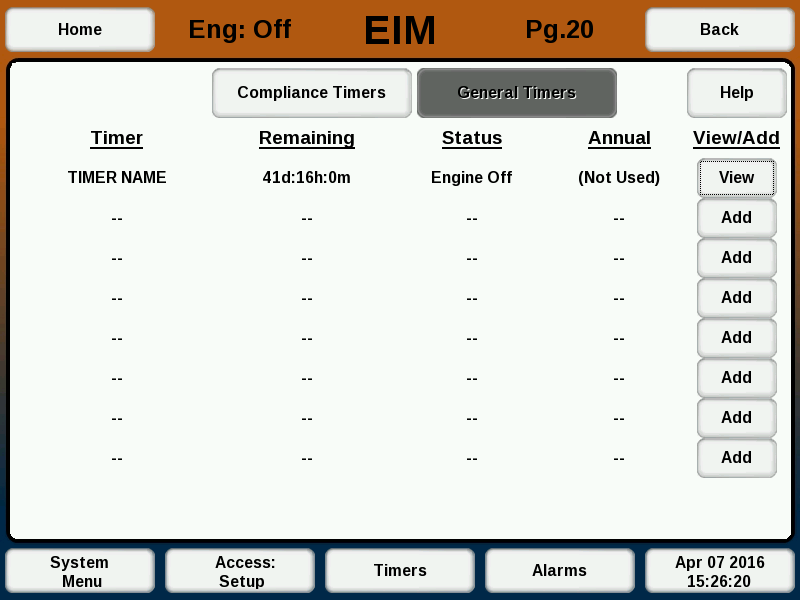 If an EMD is present and Management Practices are available, the Timer screen (Pg. 20) will display two separate sets of timers: “Compliance Timers” and “General Timers”. “Edit” – Navigates to Timer Add/Edit screen (Pg. 23) to change the timer configuration. “Restart” – Restarts the timer.